Experience top-of-the-line quality while saving space in your driveway with the Goalsetter 48" x 32" basketball hoop. 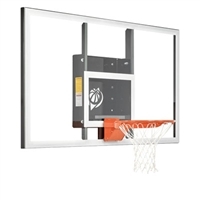 The GS54 allows you to mount the basketball goal to a wall outdoors or indoors – perfect for garages, fitness centers, schools, camps, and more. The GS48uses an external compression height adjustment mechanism to effortless adjust the rim from 7' to 10' with a 2-1/2' extension from wall to the front of the backboard for safe play. This wall-mount comes complete with a single ring static rim, rim mounting hardware, and nylon net. Backed by a limited lifetime warranty, every Goalsetter basketball goal is made in the United States and guarantees superior quality and play. Experience top-of-the-line quality while saving space in your driveway with the Goalsetter 54" x 36" basketball hoop. The GS54 allows you to mount the basketball goal to a wall outdoors or indoors – perfect for garages, fitness centers, schools, camps, and more. 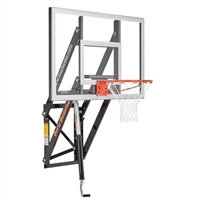 The GS54 uses an external compression height adjustment mechanism to effortless adjust the rim from 6' to 10' with a 3' extension from wall to the front of the backboard for safe play. This wall-mount comes complete with a single ring static rim, rim mounting hardware, and nylon net. Backed by a limited lifetime warranty, every Goalsetter basketball goal is made in the United States and guarantees superior quality and play. Experience top-of-the-line quality while saving space in your driveway with the Goalsetter 54" x 36" basketball hoop. 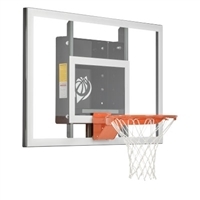 The GS54 allows you to mount the basketball goal to a wall outdoors or indoors – perfect for garages, fitness centers, schools, camps, and more. The GS54 Baseline saves space with an easy-to-install wall anchor frame and a 7.5" depth from backboard to wall. This wall-mount comes complete with a HD Breakaway rim, rim mounting hardware, and nylon net. Backed by a 5-year limited warranty, every Goalsetter basketball goal is made in the United States and guarantees superior quality and play. Experience top-of-the-line quality while saving space in your driveway with the Goalsetter 60" x 38" basketball hoop. 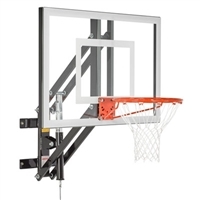 The GS60 allows you to mount the basketball goal to a wall outdoors or indoors – perfect for garages, fitness centers, schools, camps, and more. The GS60 uses an external compression height adjustment mechanism to effortless adjust the rim from 6' to 10' with a 3' extension from wall to the front of the backboard for safe play. This wall-mount comes complete with a single ring static rim, rim mounting hardware, and nylon net. Backed by a limited lifetime warranty, every Goalsetter basketball goal is made in the United States and guarantees superior quality and play. Experience top-of-the-line quality while saving space in your driveway with the Goalsetter 60" x 38" basketball hoop. 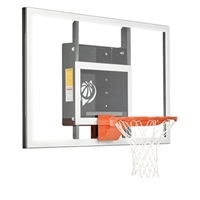 The GS60 allows you to mount the basketball goal to a wall outdoors or indoors – perfect for garages, fitness centers, schools, camps, and more. The GS60 Baseline saves space with an easy-to-install wall anchor frame and a 7.5" depth from backboard to wall. This wall-mount comes complete with a HD Breakaway rim, rim mounting hardware, and nylon net. Backed by a 5-year limited warranty, every Goalsetter basketball goal is made in the United States and guarantees superior quality and play. Experience top-of-the-line quality while saving space in your driveway with Goalsetter's best-selling, regulation-size 72" x 42" basketball hoop. The GS72 allows you to mount the basketball goal to a wall outdoors or indoors – perfect for garages, fitness centers, schools, camps, and more. The GS72 uses an external compression height adjustment mechanism to effortless adjust the rim from 6' to 10' with a 3' extension from wall to the front of the backboard for safe play. This wall-mount comes complete with a single ring static rim, rim mounting hardware, and nylon net. Backed by a limited lifetime warranty, every Goalsetter basketball goal is made in the United States and guarantees superior quality and play. Experience top-of-the-line quality while saving space in your driveway with Goalsetter's best-selling, regulation-size 72" x 42" basketball hoop. 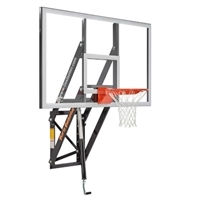 The GS72 allows you to mount the basketball goal to a wall outdoors or indoors – perfect for garages, fitness centers, schools, camps, and more. The GS72 Baseline saves space with an easy-to-install wall anchor frame and a 7.5" depth from backboard to wall. This wall-mount comes complete with a HD Breakaway rim, rim mounting hardware, and nylon net. Backed by a 5-year limited warranty, every Goalsetter basketball goal is made in the United States and guarantees superior quality and play.